“He called me from a school phone to tell me that he was going to stay late to finish his math test. I waited, then noticed none of the other kids were coming out.” Beacon Hill neighbor (and frequent BHB photography contributor) Bridget Christian and her son had a frightening experience yesterday, when Washington Middle School was put under a “shelter in place” (similar to a lockdown) after a man in the area called in a threat to kill kids. You can read her story on Flickr. DOA, CSI, I&R and more explained. The Seattle Police Department is now taking applications for the Community Police Academy, an evening class starting Thursday, March 18th, 2010 once a week for 10 weeks. The Community Police Academy is designed to provide Seattle residents with an opportunity to learn firsthand about the job of a police officer and how the Seattle Police Department works. Classes focus on patrol procedures and operations, internal investigations, the criminal justice process, crime scene investigation, bias crimes, narcotics, SWAT, use of force, defensive tactics, firearms/mock scenes, domestic violence, elder abuse, and arrest procedures. Apply early as space is limited. Applications must be submitted by Friday, January 29th. Visit the SPD Police Academy website or call 206-684-8672 for more details. 3am taco and jalapeno popper craving? SeattleCrime.com has a feature on our nearest Jack In The Box, “The Worst Jack In the Box In the Country”. 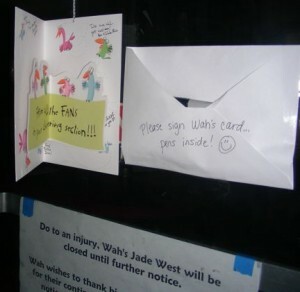 Get-well wishes for Wah Wong and family posted outside the Jade West Cafe in West Seattle. Photo courtesy West Seattle Blog. El Centro’s Roberto Maestas has been appointed to Mayor-elect McGinn’s Police Chief Search Committee. Today a young, male American Staffordshire Terrier (possible mix) followed me and my dog home. We found him near the library. He is mostly white with some brindle spots on his back and ear and has bright ice white-blue eyes. He’s very friendly. He has no tags and the veterinarian found no ID chip. She’ll be calling Animal Control soon, but if you recognize this dog by description, please call 206-971-6028.